Web-Worldz at A2Z3D.com 3D Website Development continues to move forward with new technology, better looking graphics, mobility for all devices, landscaping with beautiful trees, and …it’s snowing! Come see for yourself! http://a2z3d.com Please like and share with your friends, and let us know of your ideas for new territories or suggestions for improvement. A2Z Smart Group LLC is looking for teachers that want to help further education in this medium – give us a shout if you are interested in bringing your topic matter to 3D classrooms. A2Z SMART GROUP LLC is working to bring creativity, inspiration and education to all digital platforms: 2D Websites, 3D Websites and Virtual Worlds. We had so many questions about our work in Virtual Worlds that we created a tutorial. If you want to know more about this topic, browse around our tutorial garden…right in your browser. 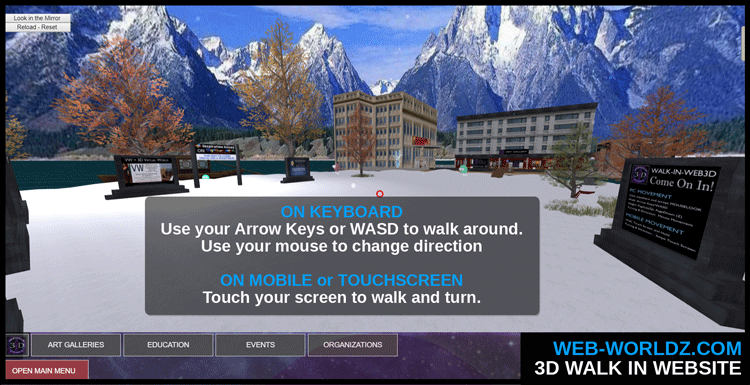 To find this Web-Worldz Territory visit http://a2z3d.com and click the Education Button on the Teleporter. The Inspiration Island Outpost is your first choice on that directory. Want a 3D Website of your own? Contact us for a FREE CONSULTATION.